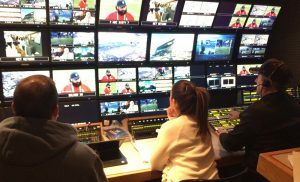 Telemundo Deportes will produce its second Spanish-language Super Bowl telecast tonight, following its inaugural effort in 2015 in Phoenix. Besides the game production, which will air on Universo and be streamed on the Telemundo Deportes En Vivo app and TelemundoDeportes.com, Telemundo has been onsite all week with a sizable presence throughout Minneapolis. Telemundo Deportes has rolled out NEP’s NCP14 mobile unit for its Spanish-language coverage, which kicks off at 6 p.m. ET with an onsite pregame special. Miguel Gurwitz will serve as the main host of the pre/postgame and halftime shows. Once the game kicks off, play-by-play caller Rene Giraldo and analyst Edgar Lopez will be in the booth with guest analyst former Arizona Cardinals guard Rolando Cantu. In addition, Veronica Contreras will report from the field and on the sideline. Telemundo Deportes’ game coverage is just the final chapter in an eventful week in Minneapolis. Its nightly sports program Titulares y Mas has broadcast from a set at Mall of America since Monday, providing extensive coverage that includes segments and reports by show host Karim Mendiburu and Cantu. In addition, Erika Csiszer, from morning show Un Nuevo Dia, and Noticias Telemundo correspondent Ruben Pereida are joining the team onsite. In addition, regional Mexican singer and actor El Dasa (star of Universo’s original scripted series El Vato) has been on hand all week, featured in Super Bowl-themed segments at Nicollet Mall and the Mall of America.